The last couple of days there has been a bit of a firestorm in the hobby, beginning with Steven Judd tweeting about loaded boxes being used as a marketing strategy and following up with Chris Olds posting what appears to be an ill-timed, poorly-veiled claim of innocence… or ignorance depending on how you look at it, on the Beckett Blog. 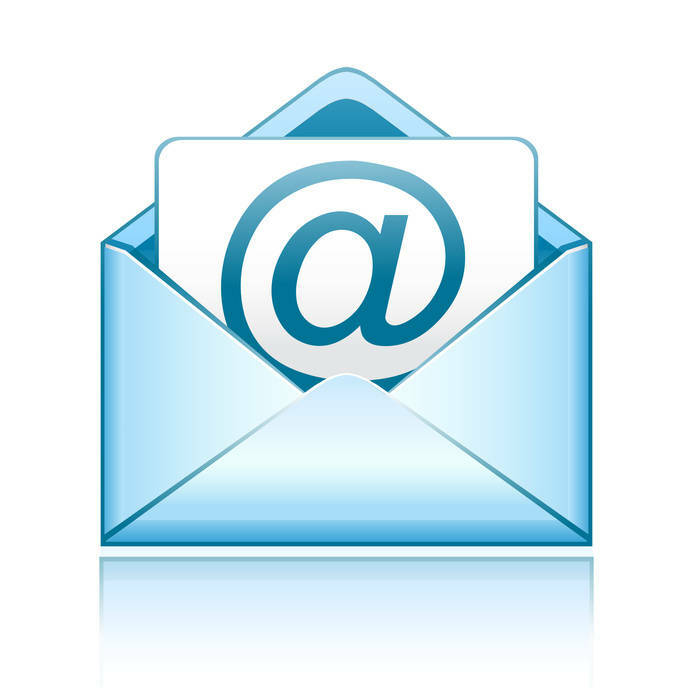 If you read through the many comments posted in response to Chris Olds’ blog posting you will come across a post by Olds himself where he seems to deflect the blame on to Topps and even states “if you’d like to accuse Topps of sending loaded boxes more directly, you can contact Clay Luraschi at Topps directly cluraschi@topps.com”. I decided to take his advice and I sent an email to Clay Luraschi straight up asking if they send loaded boxes to Beckett. As a graphic designer I understand the importance of a proper marketing strategy. I am currently working on a buzz marketing strategy for a small beverage company. So, guerrilla marketing is nothing new to me, but there are certain ethical and to a point even legal ramifications involved with this type of action. I currently await Mr Luraschi’s response. The WNBA may not be as well known as the NBA and most basketball fans can probably not even name a current WNBA player, but that has not stopped the league from surging forward. 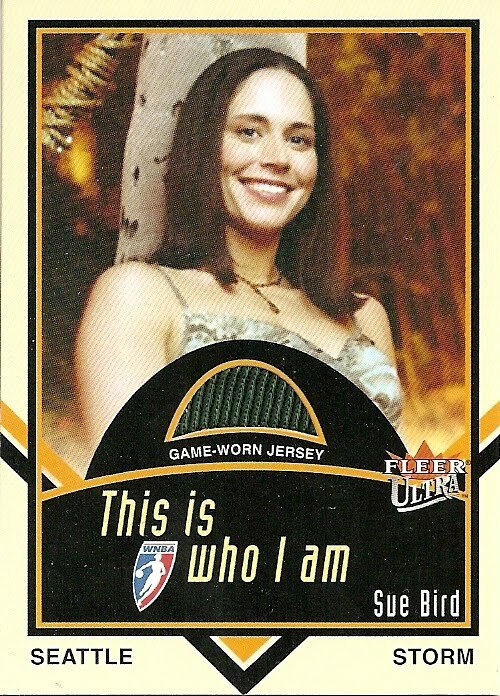 Players like Cynthia Cooper, Lisa Leslie and Sheryl Swoopes have come and gone, some of the greatest to ever play the game and you can still find many of their “top” cards selling for well below $100 each. Even today’s biggest star, LA Sparks Candace Parker, still has relics and autos selling in the $50-60 range. My attention turns to one of the two teams that I actually follow, the Seattle Storm (the Phoenix Mercury being the other team I follow). The Storm have railed off 13 straight wins and at 22-2 stand within 3 wins of tying the Houston Comets for the best start to a season ever. With only 10 games left, the Storm actually could be racking up the wins on their way to a 2nd title in 6 years. Jeremy Tyler is in the news again, the player who at one time considered a Top 3 pick in the 2011 NBA Draft, this time is slightly positive news. He signed a contract with the Tokyo Apache of the JPL (Japanese Basketball League). 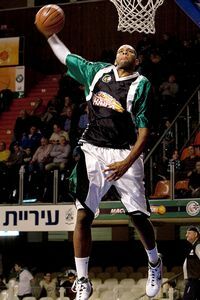 Hopefully this round will last longer then his first professional tour with Maccabi Haifa, which lasted only 10 games before he quit the team. I wrote about Tyler back in March after he quit the Israeli team, hopefully his time with the Apaches will last longer and with better results then his time with Maccabi Haifa. Another failed attempt will most likely put a damper on any dreams that Tyler has of ever playing in the NBA. 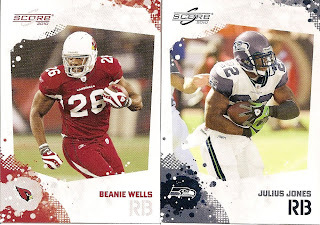 I picked up a couple of random packs recently; tonight’s cards are from the 2010 Score Football release. For being a low end base set this is actually a decent quality card. Panini has something with paint splotches, which normally bother me but honestly in a low end set it does not bother me. The inserts are pretty basic, again what you would expect from a low-end release. For the low price that you pay you actually get a decent selection of cards and inserts that are fun. 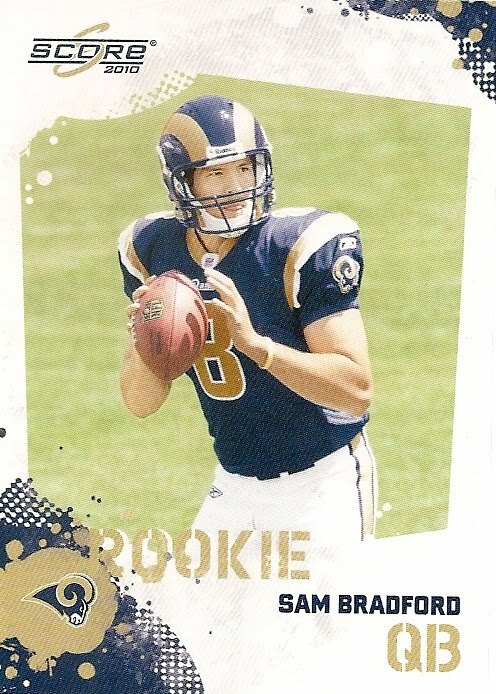 I guess I can not really complain when I pull a Sam Bradford rookie card too. Stephen Strasburg was scratched from his scheduled start tonight after being diagnosed with inflammation in his pitching shoulder. The Nationals are hoping that a few days of rest and anti-inflammatory medicine will do the trick and considering that an MRI and X-rays both show no damage Stras should be back throwing 100-mph fastballs within a week. You now have to wonder if the 109 2/3 innings that he has thrown so far this season, already 2/3 of an inning more then he threw all of last season at San Diego State, has put his arm to the test. The Nationals have already said that they plan on shutting him down for the season once he hits 160 innings, which should give him another 9 games if he continues to average 6.0 innings per game. This could be devastating if this is a sign of what is to come, hopefully this is just a hiccup for the wunderkind. Being a vintage collector I love the “Old is New” releases. Sets like Goudey, Goodwin Champions and Allen & Ginters always draw my attention, but now that A&G has become to much of a mainstream for me I can still turn my love towards Tri-Star’s Obak release. The set is broken down in to 3 categories; base set, mini set and cabinet set. The base set contains 120 cards, the T-212 mini set contains 45 cards and the T-4 cabinet set contains 30 cards. There are also a total of 121 autographs made up of 101 “modern size” cards, 13 T-212 minis and 7 T-4 Cabinets. 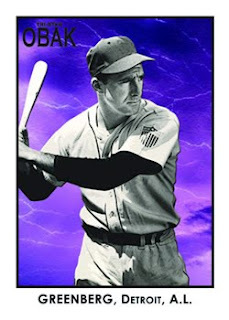 Since Tri-Star does not have a MLB license the cards are made up of past-stars, future stars/Minor leaguers and a mixture of “game changers” and other sports icons. Looking over the checklist and you will be surprised at the names that pop out. The autograph checklist is amazing; players include Jason Heyward, Starlin Castro, Johnny Bench and Cal Ripken Jr. The cut autographs list is even more amazing, the checklist includes Joe DiMaggio, Mickey Mantle, Satchel Paige, Eddie Cicotte, Barack Obama and are you ready for this? A dual cut-autograph of Stephen Strasburg and Bryce Harper! I rate this set 4 out of 5 because it is small enough for set collectors, contains stars from the past and future stars and has a very nice checklist but it looses out because of sticker autographs. This is the first basketball set of the season and Panini is really trying to make a splash with the set. The big selling point for this release is that there are 20,000 on-card autographs in the set. 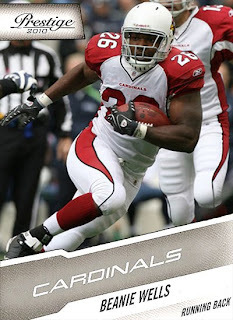 Oddly enough Panini has not released any images of the base cards only images of the hits. I am not sure if this is a situation where the base card designs have not been determined, if Panini is not satisfied with them or if the plan is to sell the set totally based on the hits. You will see plenty of “Firsts” in this set including the first cards of Number 1 pick John Wall, autographs of Evan Turner and Wesley Johnson, autographs of Amar’e Stoudamire, Chris Bosh and Carlos Boozer in their new uniforms and I am not definite but I think we will also be seeing LeBron in a Miami Heat jersey. 20,000 On-card autographs, on-card autographs, on-card autographs. This is a turn for Panini with the on-card autographs. 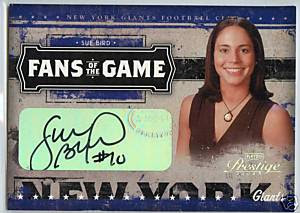 Many collectors have complained about lick-em stick-em autographs and Panini listened. A killer autograph checklist that includes (among others); Kobe, Shaq, Nash, Magic, Gary Payton and Doc Rivers. Plus the first autographs of Evan Turner, Amar’e Stoudamire (Knicks), Chris Bosh (Heat) and Carlos Boozer (Bulls). Not seeing the base cards could either mean nothing or it could be a bad thing. 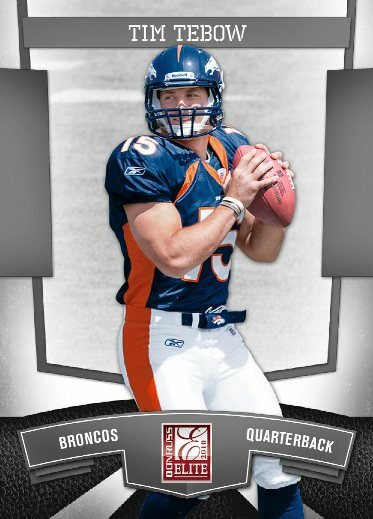 Nothing listed about parallels, again this could mean either Panini did not list them but still be there (bad) or there may not be any parallels (good). I am rating this 3 out of 5 because there is so much upside to the product. I am withholding any additional points because I have not seen the base cards and I do not know if there are 101 parallels or not yet. There was a loss of a point because there are some awkward angles and weird die-cut windows. Topps just announced that they too will have a special release available only at the National. 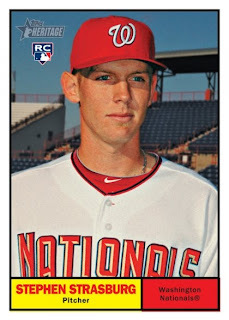 Any collector that opens 10 packs of Topps or Bowman releases (not including Attax, Opening Day and the .99 cant cello packs) at the Topps booth during the National will receive a 2010 Topps Heritage Stephen Strasburg card #/999. This card is a special release and is numbered as so, the cards number will be No. NCC1. Collectors will be limited to only 1 card per person per day and this “prize” is obviously limited to the first 999 people to open 10 packs. I have to admit, I really like this card. I am all about simplicity and Heritage does it well. I will not be at the National and these cards will most likely be well over-priced when they first hit eBay, I guess I will have to wait to pick one up. Beckett has reported that Panini will unveil LeBron James’ first card with him in a Heat jersey, additionally Chris Bosh cards with him in a Heat jersey will also be released. Collectors who open 5 packs of Panini NBA or NFL cards at Panini’s booth will receive a pack of cards made specifically for the National. There are a total of 50 athletes from the NBA, NFL, hockey and college baseball that will be available in these special National packs. The list of 50 athletes includes James and Bosh in their new Heat jerseys as well as others I have listed below. I picked up some packs of 2010 Panini Prestige Football and I have to say that I am disappointed. I cannot understand the fascination that Panini has with lines and angles; every card set has some odd angle to them. The designers must begin with a protractor and a blank card and go from there. Now there is a way to work angles in to a design and still have something worth looking at and then there is a way to ruin a card from the start. Using the Prestige base card I created a mock up using the current base design to give the card a more pleasing aesthetic. Base above left, mock up above right. 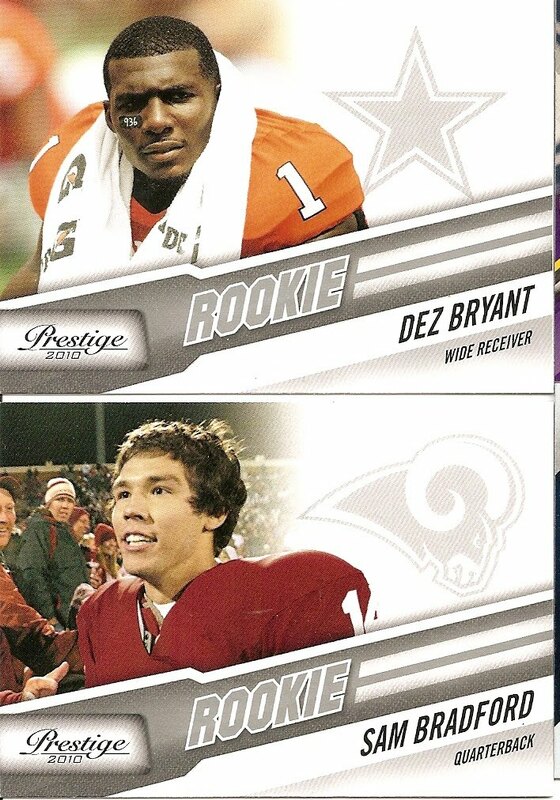 I pulled a couple of rookies including Sam Bradford, Dexter McCluster and Dez Bryant. 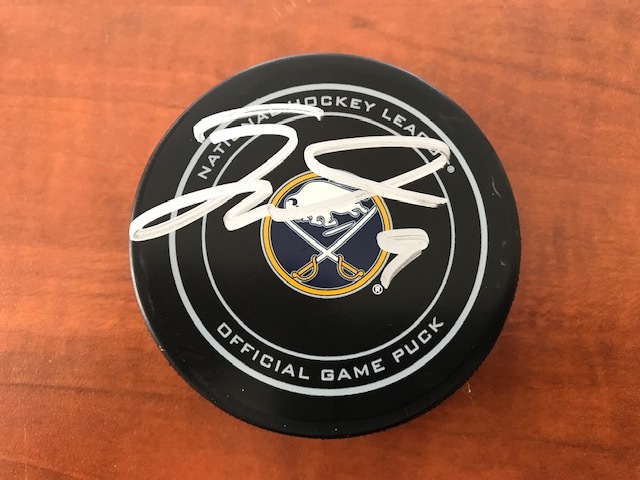 I actually kind of like the rookies, they are set up perfectly for the autograph, which unfortunately is a lick-em stick-em auto. The insert sets are another round of crazy angles and colors with foil board tossed in to add that extra irritation you already feel by the time you pull an insert. 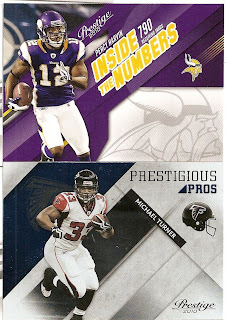 Topps recently released a preview of the 2010 Topps Triple Threads Football. 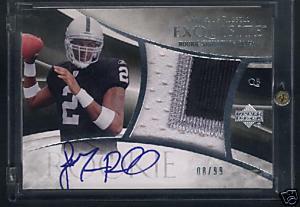 This year Topps is adding some interesting relics like Laundry Tags, NFL Shields and Jumbo Jersey Sleeve Patches. Each box will contain two mini boxes, each containing 6 cards. Each mini box contains 1 Triple Relic #/99 or less, 2 base parallels #/525 or less and 3 base cards #/1350 or less. 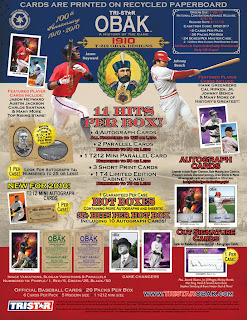 You will also find 1 Autographed Triple Relic per display box. The release contains 10 Autographed Triple Relic insert sets, 9 Triple Relic sets, the XXIV set (each card contains at least 24 relics), Laundry Tag Book Cards set and a NFL Shield set. The base set contains 100 cards consisting of current players and legends and there are 5 different parallels for each base card- Sepia (#/450), Emerald (#/299), Gold (#/99), Ruby (#/25) and Platinum (1/1). You may not have liked the Yankees, Hell… most people hate the Yankees but you do have to admit that George Steinbrenner knew how to win. He opened his wallet so often that every time a big name player became available the Yankees were automatically tossed in to the rumor mill as the new destination. In 37 years as the teams owner the Yankees made it to the World Series 11times, winning 7 World Series Championships. He changed the way that teams functioned and while managers never lasted to long, his players were happy. Of course he had his faults, he was always one to get involved with all aspects of the team, often making the final decisions on which players came to town to wear the pinstripes. He controlled his players on and off the field, perhaps a little to sever but if you played for the Yankees you expected it. Unfortunately this is the second loss that the Yankees have taken in the last three days having lost the “Voice of the Yankees”, Bob Sheppard on Sunday. I think many of us will think of Larry David's portrayal of "The Boss" on Seinfeld when we hear the name George Steibrenner. I know, I know… I normally do not cover hockey much on the blog and here I am covering 2 hockey releases on consecutive days… what next? I have not collected hockey for about 6 years now, a lockout will do that to collectors. Following the 2004-05 NHL lockout I just lost interest in the sport and did not feel like collecting hockey anymore. Upper Deck knows how to put out an upper end product. This set is not made for the set collector but for the collector looking for the big hits. Every card is limited to 399 or less with autographs #/25 and less and memorabilia #/200 or less, with most memorabilia #/50 or less. The Ultimate Nicknames is one of my favorite inserts, a cool design, a nice checklist that includes my favorite player, Messier, along with Lemieux, Bobby Hull, Howe and Don Cherry. I have always been a fan of Ultimate; the price tag has actually inched down over the years but still up there (though not as high as something like National Treasures). You do get some decent cards for your purchase though. I rate this set 4 out of 5 because there are so many positives to the release. Good photos, nice design and some of the autographs at least appear to be on card, though I am not sure if they are all on card or if some are lick-em stick-em autographs. Information about the 2010-11 Panini Certified Hockey has been released and this set is all about the hits and not a bad price for a box either. This is Panini’s first attempt at hockey since coming to the US, originally Panini was expected to release Score Hockey as the first hockey release of the year but that apparently has been delayed so the honor of Panini’s first hockey release will be Certified instead. First, this looks like a re-tread of 2009-10 Certified Basketball. The awkward lines are there, the use of colors; the floating swatches and the sticker autos are all back. On top of that there are plenty of parallels, a Panini specialty. On the positive side Panini used some very good player images, which seems to be less and less common among recently releases across all companies. Some of the inserts/hits are “Big Men On Campus”, which includes a jumbo swatch of young players from their college days. The “Junior Legacy” set contains dual memorabilia or autographs of players who came up through the Canadian Junior leagues. 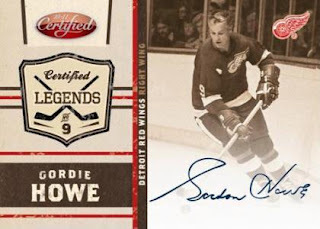 The “Masked Marvels” set contains memorabilia/autos of the top goalies and the “Certified Legends” set contains autographs of the legends of hockey. One thing that is nice is that Panini is including the word “Prime” on multi-colored swatches/tags so this should help deter scumbags who remove single color swatches and insert multi-color swatches and sell them for a premium. 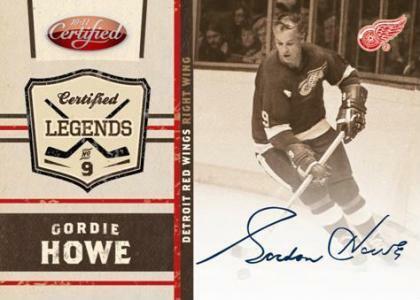 The Certified Legends set has autographs of some of the best to ever take the ice. Players like Howe, Lemieux, Roy and Esposito. These autos look like they are hard signed too, but I am not certain. I love this insert set, the sepia tone colors, an amazing checklist and if these are hard signed autos, this could be the big splash of the entire release. There are Platinum Hot Boxes where all of the common cards are replaced by exclusive, limited edition parallels. Parallels galore, way to many for set collectors. Floating patches and sticker autographs. Considering that this is Panini’s first shot at hockey since coming to the US, hopefully this is a learning experience for them. They cannot just take a basketball release, toss hockey pictures on it and call it a new set. Some of these inserts could turn out to be classic hits if the design is recreated to where they become “more attractive’ to the collector, I am talking about sets like Junior Legacy and Masked Marvels. I give this set a 3 out of 5, Panini is trying and they are new to the hockey scene so I cannot ding them to hard. If they can turn this around, re-design the basic elements of the base set and a couple of the inserts they could have a winner here. A reasonable price and a very good chance of getting some good hits make this a possible classic set. All I can say is “Wow”; the team to beat has suddenly become Miami… if they can suit up enough players. 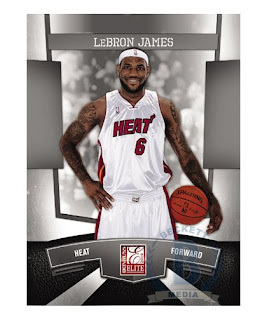 Expect to see the new Heat players in their new uniforms when Panini’s 2010-11 NBA Prestige hits the shelves around the end of September. JaMarcus Russell has his name in the news again after getting arrested yesterday in Mobile, Alabama for possession of a controlled substance, supposedly codeine syrup without a prescription. When you consider some other professional athletes have returned to the field/court after making bigger mistakes and even doing prison time, this is not something that can be overcome. The problem is that Russell is known for his laziness and lack of commitment on the field. 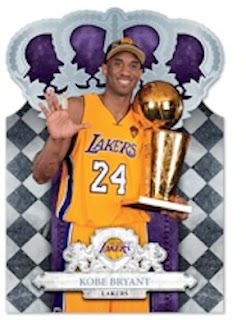 That is something that will not be overlooked by most teams not to mention collectors. It makes me wonder if any team will actually pick him up even as a 3rd stringer or practice squad. Doing a quick search of the bay and you can find around 1,700 JaMarcus Russell cards, scan through the pages and you will find no more then 6-8 total bids out of all of those auctions. You can get rookie cards for under a buck and most jersey and autograph cards are realistically posted under $5 each. You almost feel sorry for the people that were dropping hundreds of dollars on his cards back in 2007, sadly enough there are people still posting his 2007 Finest and Exquisite autographs up for auction at prices that they were selling for 3 years ago. A true tale of caution for collectors, ability will always work out better then draft position. 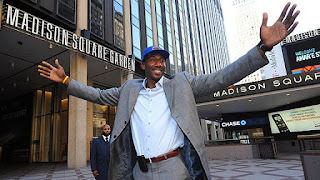 The first “shot” has been fired by the New York Knicks in the 2010 NBA Free Agency period. With the largest prize, LeBron James, announcing that he plans on staying mum for a few more days the Knicks kick start the activity by coming to an agreement with Amare Stoudamire for a 5-year $100 million contract. While the contract cannot actually be signed until Thursday this is basically a done deal. As a Suns fan this is saddening news, it is always tough to see a major star leave the team but it is even worse when they are lost to free agency with nothing in return. Hopefully something good can come from free agency for the Suns, maybe in the shape of a guard via Miami or a forward from Toronto? I wonder if Phoenix will now jump in to the action or just sit around? Independence Day is a big day for Americans, but July 4th is also an important day for the IFOCE, the International Federation of Competitive Eating. Today Nathan’s Famous held their 94th Annual Hot Dog Eating Contest. A contest that draws international news and media outlets, all watching to see who can down the most dogs in a 12-minute contest. The biggest news of the day does not center on Joey Chestnut, the winner of the last 4 Mustard Yellow Belts, but instead on 6-time Champion Takero Kobayashi who refused to sign an IFOCE contract and therefore was barred from competing in the contest this year. After the contest ended Kobayashi jumped a barrier and tried to get on to the stage but was subsequently detained and arrested. He is being charged with resisting arrest, trespassing and obstructing governmental administration. This is truly a sad day for the IFOCE when one of the biggest competitive eating “stars” attempts to make a demonstration at one of the biggest competitive eating contests in the world. Kobayashi’s name is known worldwide and even has shown up in the 2006 Allen & Ginters set. 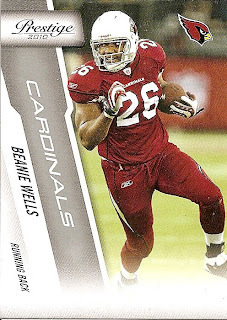 His 2006 A&G card #312 autograph sells for well over $100 when it can be found. If you are interested in Joey Chestnut cards, his card #109 appears in the 2008 A&G set. He also has relics and I believe an autograph in the 2008 A&G set as well. Sunday we celebrate Independance Day, the 4th of July, a day when we stood together as a group, as one nation and declared our independance. 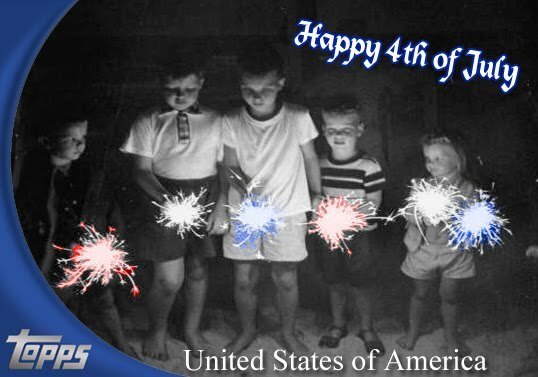 While this is not a day dedicated to our armed forces, we need to thank those who have defended this nation for the last 234 years and allowed us to continue the traditions that we all have come to love... fireworks, BBQs, neighborhood parties oh, and of course did I mention ... fireworks. Light some sparklers, grill some burgers and stay safe. I hope you all have a wonderful weekend with your families and friends. Where can you find beans, torch wicks, dominos, Tony Hawk’s skateboard, a dog’s Frisbee and a juggling pin? 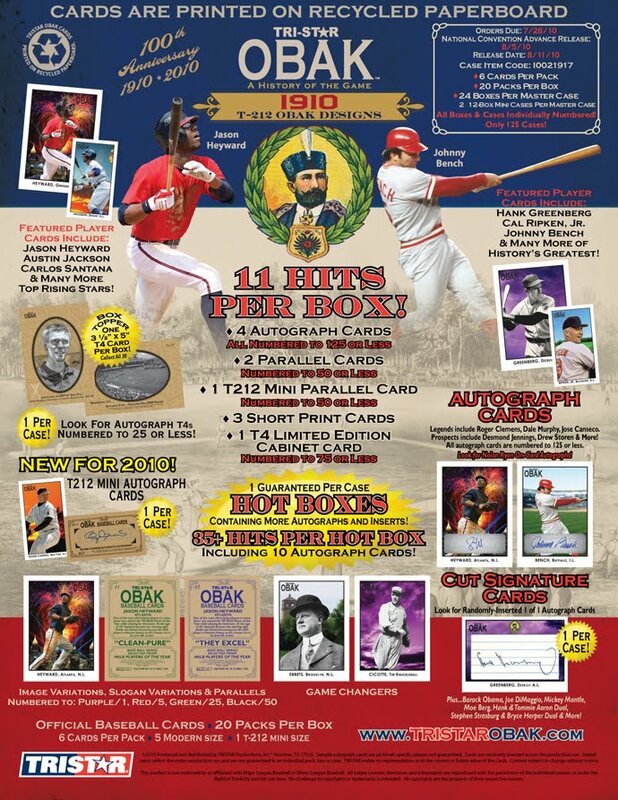 You would find them in the same place that you would also find Topps employee’s autograph, a David Blaine card and Regis Philbin’s tie, in the 2010 Allen & Ginters release. Topps has once again topped themselves with the inclusion of some very peculiar relics on the checklist.